On Plastic Beach, the third effort from the virtual space rock/hip hop group Gorillaz, bandleader Damon Albarn has a revelation akin to that of a Jane Austen character. Ever since his band of animated hipsters released its self-titled debut in 2001, Gorillaz has felt like a lark for Albarn, a fun side project that let him scratch his hip hop itch and do other things he couldn’t do with his primary creative outlet, the much-beloved Britpop group Blur. But at some point over the last few years, the singer/songwriter/producer realized that Gorillaz was more than just a cool diversion. Listening to the wildly eclectic sounds, indelible melodies and post-apocalyptic concepts of Plastic Beach, it’s clear that Albarn has realized that his “other” band is the one he was meant to lead. On paper, the formula is pretty much the same as the first two Gorillaz discs. Get a crackerjack group of guest artists and let them run wild, countering their ebullient contributions with chilled-out electronic grooves and Albarn’s levelheaded vocals. 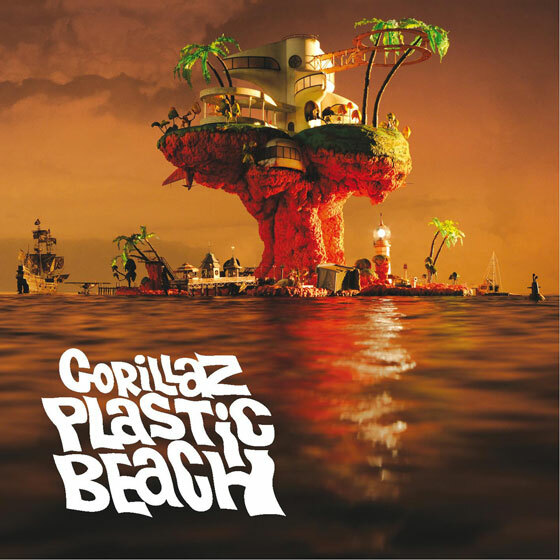 But Plastic Beach is something more than its thoroughly entertaining predecessors – it’s the result of a fully realized vision, in which every pop hook, stylistic twist and pseudo-sci-fi moral has its place. For the first time, Albarn has made a record that’s as adventurous and bold as its guests, full of moody Britpop atmospheres, burbling funk jams, aching bursts of R&B and full-on orchestral bombast. The magnificent “White Flag” acts as a microcosm of it all, combining the hypnotic Eastern melodies of The Lebanese National Orchestra with bursts of playful electro-rap for a track that has an immediacy and personality all its own. And when Albarn follows it up with the emotionally resonant post-punk ballad “Rhinestone Eyes,” singing about how his love’s eyes glitter “like factories far away,” it becomes clear that there’s nothing at all cartoonish about these Gorillaz anymore. Like Emma Woodhouse, Damon Albarn has realized that his real muse was right in front of his face all of these years. And he’s made it awfully hard to not fall in love with Plastic Beach. Next Post → Let me off!!! LET ME OFF!!! !